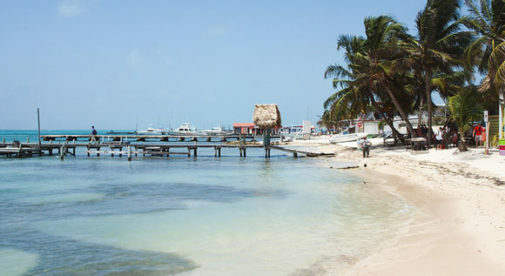 This is Ambergris Caye—an island less than 40 miles from the mainland of Belize. You seldom need a sweater on this popular Caribbean island with comfortable semi-tropical weather year round. Temperatures typically in the 80s F during the day, and cooling to the 60s F to 70s F at night. So you can indulge in a delicious meal at an open-air beach cafe any time of year. Ambergris Caye is often referred to as Isla Bonita, or ”beautiful island.” Close to the mainland, it’s easy to make a quick jump off the island whether for a short vacation, or a shopping trip. Water taxis leave regularly for Belize City, as do small airplanes. You can reach the mainland in less than 30 minutes. And although you can get everything you need on the island, some expats enjoy taking a water taxi to Chetumal, Mexico for the day, mainly to shop. Infrastructure is improving. The local airstrip is now able to accept night flights as needed. The air terminal is in expansion mode. And this year more than 10 miles of road north of the bridge in San Pedro (that joins the south of the island with the north of the island) is being paved. Recently the Prime Minister announced that a second international airport will be built on the far north side of the island. The government is clearly investing in the island. And you’ll find good deals here…you just need to know where to look. The best on-beach deals are usually found for resale condominium units in established developments. There are a variety of beach condo complexes that have a track record and reputation, and are well priced when compared to new condo developments. For example, I found a one-bedroom condo at an established beach development going for under $89,900. It’s only one-and-a-half miles south of the town center. Look a half-mile across the bridge and you can find furnished two-bedroom condos. In an established condo complex, I came across one for $280,000. Both are close to the town’s amenities, but removed from the hustle and bustle of the town center. Another option is to look north where major growth is occurring. It used to be an ordeal to navigate the dirt road north during the wet season. But paving of 10 miles of the road north is underway. It should be completed during the next dry season. Once the paving is complete, it will be much easier to reach the more remote northern areas of the island. But real estate prices have not yet adjusted upwards for the few northern condo complexes already there that aren’t as easy to reach. Right now you can buy a new condo or casita on the beach for under $130,000.